Companies are increasingly looking for people with strong analytical skills to fill their positions. For most companies that means being proficient in Microsoft Excel, since a lot of companies are largely Excel-driven. 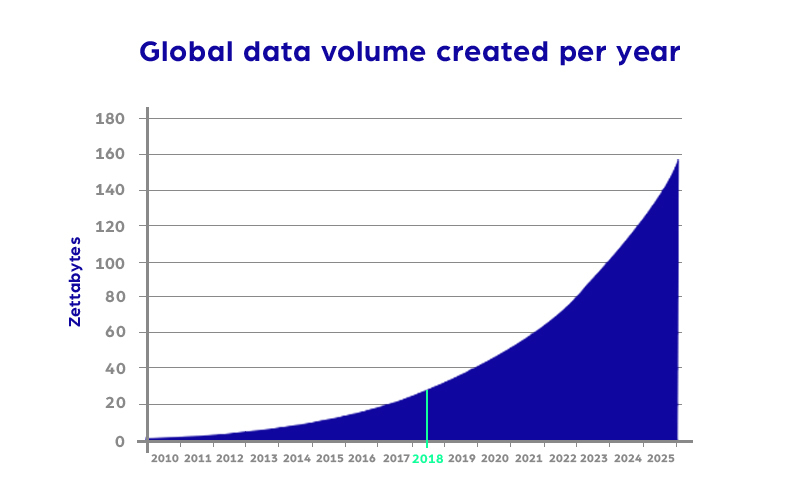 However, consider the fact that the global data volume will grow almost six-fold (IDC) by 2025. Being good at Excel will be an outdated skill by that time. Just think for yourself, how many times have you already been struggling to make an analysis or series of graphs in Excel and even when you managed, how long did it take you or Excel to process everything? Such things will only become way worse in the coming years with the ever-growing volume and complexity of data. So being able to work with larger data sets, to know which tools can handle the data and draw the right conclusion from your analysis, will be a key skill to improve on in the coming years. Numerous people state business analysts will lose their job because of the rise of data scientists, the people with the strongest data handling skills. But claiming such shift in jobs is a serious statement, certainly because business analysts will always stand closer to the business and have a better business understanding. A much more realistic scenario is the close collaboration between these two functions, where the advanced analytics will be shifted to the data scientists. Such cooperation could be a ground breaking partnership. In order to fully leverage this bond, a key skill for business analysts will be to understand the data science capabilities and possibilities. It’s by far not necessary to know how artificial intelligence, predictive models, machine learning or any other heavy data algorithm works, but you should be able to identify what business value it can create. Want to achieve these data skills? Check out our training overview and get started! Let’s get things straight, you don’t need to become a die-hard statistician. Still, you should be able to understand the conceptual principles of statistics, so you do not draw any wrong conclusions from your data and base your business actions on it. Think about the fact that using averages is not always a good idea, as it removes those outliers you actually want to have some insights on. The perfect way to illustrate this is that if you would do such thing in a hospital, everyone would be healthy. Doesn’t sound pretty realistic, does it? This is just one simple example of how things can become dangerous when lacking an understanding of data limits. For the moment, lacking these limits is not such a big issue because your business understanding is more than good enough to evaluate your analysis outputs. However, when the amount of data will be 10 times bigger and way more complicated, you will find yourself in a very risky situation without that statistical understanding. Get the skills, assure your future and outcompete everyone! It must be clear that the data science trend will have a massive impact on every single business area and the business analyst role is no different. Business analysts can heavily exploit this trend and turn it into a source of powerful knowledge, which is still massively untapped. This can be achieved by handling data more efficiently and by knowing what the Data Science capabilities are. If you are able to strengthen these skills by for example, taking courses, you will heavily kickstart your Business Analyst career in a couple of years and assure your future!